Author, consultant, speaker and children safeguarding expert. Ann Marie inspires and motivates organisations in keeping children safe and bringing child protection to the front line and embedded in the daily practice. 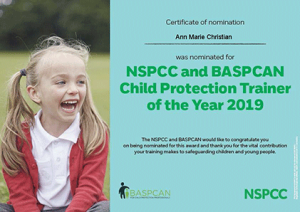 Ann Marie helps schools, organisations, charities, churches and childcare settings in understanding their statutory duty and responsibility in keeping children safe. She set up Child 1st Consultancy Limited in 2010 after working for the local authority in front line child protection since 1996. She worked in partnership with colleagues in various settings and understood their challenges in working with child protection and chose to support them in offering bespoke intense support via training and consultancy. Ann Marie delivers work as an associate with ISI Consultancy, The Boarding School Association, NSPCC, IAPS, AEGIS, The Key, Smoothwall, Independent School Portal, The DRB Group, Chapel Street Trust, Headteachers Update and many more.